It is similar to the species except the leaves are deeply divided, creating a fine-textured ferny appearance in the summer. Yellow clusters of flowers are followed by fuzzy red cones of fruit in fall. It is very heat and drought tolerant. Fall color is bright red. It prefers full sun to part shade and a well-drained soil. 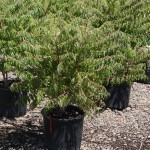 Use for mass plantings or in naturalized plantings.